Last month a small slice of Mancunian history appeared in Miami. Conceived in collaboration with Ben Kelly – the architect responsible for Manchester’s iconic but now defunct Haçienda club – designer Virgil Abloh presented his own homage to the historic nightclub venue at Art Basel, in the form of a portable DJ space. It carried the same motif that instantly conjures up connotations of his fashion label Off-White, with its diagonal stripe branding, but to a certain older generation, those same stripes unmistakably say ‘Haçienda’. While fashion’s appropriation of punk has become a trope, and rap has traded its baggy jeans in favour of snake-embroidered Gucci ones, Abloh’s collaboration was a reminder of one of the more slept-on (but equally important) facets of this relationship. Founded in May 1982 beside Rochdale Canal, The Haçienda was the work of Manchester’s Factory Records, a seminal label of the post-punk era. Few that have come since have had such an effect on the landscape of fashion, acting as a rich source of inspiration and iconography. This was, of course, never the primary goal of its founders’ Tony Wilson and Alan Erasmus when they launched it in 1978, and nearly all of the sartorial tributes came long after the label’s closure in 1992. The bands they represented, such as Joy Division, The Durutti Column and latterly New Order and Happy Mondays, were imperious in their sonic approach, but Factory Records was in many ways defined by its radical aesthetic as much it was by its musical output. Drawing heavily from the Situationist movement of 1968, the label’s praxis and artwork often served as an elegant and often minimalist riposte to the haphazard years of punk that had preceded it. Even Factory’s systematic numbering of all its output, from music releases to objects, felt decidedly contrarian – not unlike the product categorisation used by Martin Margiela (a Factory Records fan, according to his former Music Director, Frédéric Sanchez) some years later. The man tasked with translating much of this into striking visuals was designer Peter Saville who, through his work for Factory, created some of the most iconic record sleeves to date. It is this vast and impressive oeuvre which has served as a muse to the likes of Raf Simons, Yohji Yamamoto and Jun Takahashi of Undercover. And beyond the catwalk, Factory Records’ visual prowess has also been embraced by Supreme, adidas, Abloh and, yes, Urban Outfitters. You’ve seen it before: on Tumblr, on t-shirts, and bizarrely you might have even seen it on the sleeve of the record it was originally made for. Perhaps no cover artwork has ever had such crossover appeal as Joy Division’s Unknown Pleasures. Designed by Saville, it was based on an image of radio waves taken from The Cambridge Encyclopaedia of Astronomy – and has been gradually bastardised, appropriated and stripped of much of its original potency ever since. Simons incorporated it into his AW03 collection (more on that later), and in 2005 Supreme collaborated with Saville to release a t-shirt that carried the album’s artwork. It was again a source of inspiration in 2009, when Undercover unveiled its Autumn/Winter collection, complete with a leather biker jacket that subtly featured the print on its inside. Takahashi’s work has long been underpinned by a fixation with the music that filtered out of post-industrial Britain. Following the death of frontman Ian Curtis, the remaining members of Joy Division formed New Order. It was a departure from their previous incarnation’s austere moodiness and with it came a new visual outlook, one which merged modernity seamlessly with classic elements of fine art. It was this formula that saw Saville apply coloured blocks – evoking Gerhard Richter’s colour paintings of 1973 – to Henri Fantin-Latour’s 19th century still life A Basket of Roses for the group’s second album, Power, Corruption & Lies. This album cover would become what is perhaps the most memorable motif of Raf Simons’ AW03 Closer collection, which drew heavily from the Factory Records aesthetic of the late 70s and 80s. With full access to Peter Saville’s archive, parkas (which have been known to sell for in excess of £10,000) were emblazoned with some of his most famous pieces of work for the record label. 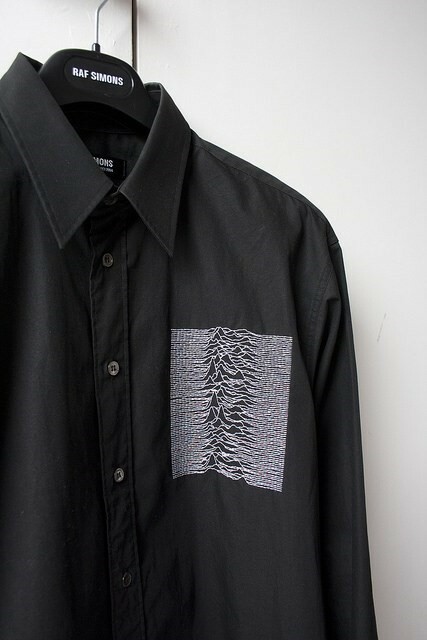 But rather than serving as a homage to single albums, Simons’ bricolage approach pieced together various elements of visual ephemera from Factory Records – the most iconic parka from the collection, which features the artwork of New Order’s first two LPs also includes a circled ‘F’ on the left sleeve, a reference to Fractured, Joy Division’s publishing imprint and a subsidiary of Factory. Ten years later, Supreme would again draw on the same imagery as Simons, applying the Power, Corruption & Lies artwork liberally in their SS13 collection. Throughout the 80s, Yohji Yamamoto regularly enlisted the help of Peter Saville to create hyper-contemporary campaign images, but it was the Ben Kelly-designed Hacienda that would serve as the inspiration for a one-off sneaker collaboration in 2007 as part of his on-going work with adidas under his Y-3 label. 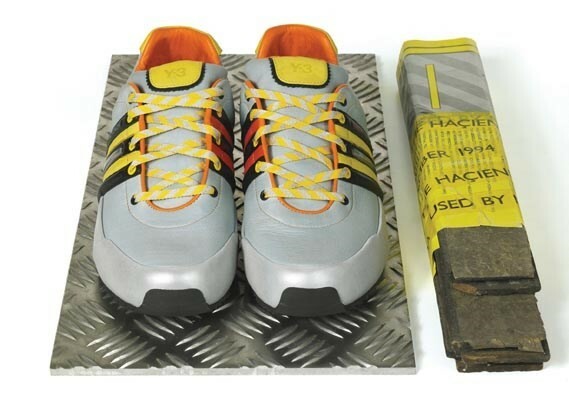 The low-cut boxing sneaker (which had a number rather than a name) took its visual cues from the club’s industrial look and bold colour scheme of safety-yellows and oranges, and came in a box shaped like the original Hacienda dancefloor and wrapped in the 1980s’ club photography of Kevin Cummins. 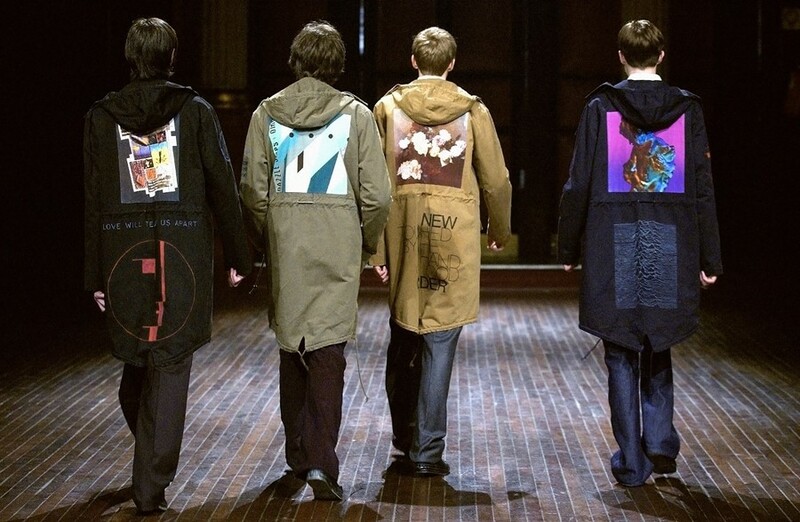 In 2014, Raf Simons again returned to Factory Records as a visual reference point for his collaborative line with Fred Perry – somewhat fitting for a brand that has been subculturally-synonymous with the north of England for decades. In a style not dissimilar to Off-White’s signature graphic, Simons applied The Hacienda’s diagonal stripe motif to a series of polo shirts and bomber jackets. Later this week, Abloh and Kelly’s Hacienda-inspired installation will be reappearing in Liverpool, somewhat closer to its spiritual home, as part of Open Eye Gallery’s latest exhibition, ‘North: Identity, Photography and Fashion’. The show will celebrate the enduring cultural influence of the North – and, consequently, of Factory Records – beyond its geographical confines, from Manchester all the way to Miami.